Well, well, well. Look what we have here, a Grainline Archer from a girl who swore she was going to make her second version over two years ago. Oops! I've been getting jealous of all the cute Archers I keep seeing on Instagram, so I decided to get my life out of the gutter and start sewing. The first version I made rarely got worn and here is why: it looked like an over sized shirt that a kid stole from her dad's closet. 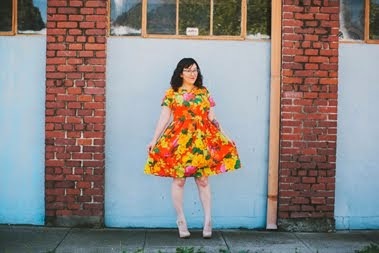 I'm not hating on the pattern at all, just hating on my own sewing decisions. Changes needed to be made. Badly. For my second Archer I made the following adjustments: took in the shoulder by an inch, shortened the sleeves by two inches, and added 3/4 inch to the sleeve cap because I changed the shape of the shoulder. Over time I have realized that these are common adjustments for me and my T-Rex arms and luckily the changes worked out great! I'm happy with the fit and stoked on how smoothly the sleeves went in. In fact, I'd even go so far as to say that it was my cleanest sleeve insertion ever. Yeah! 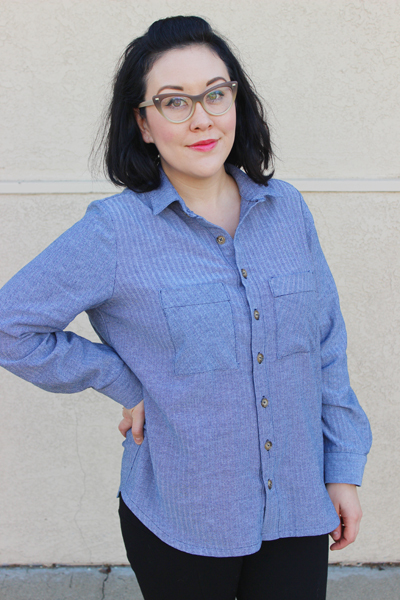 It might be hard to see in the photos, but the fabric I used has a herringbone print, which I love. 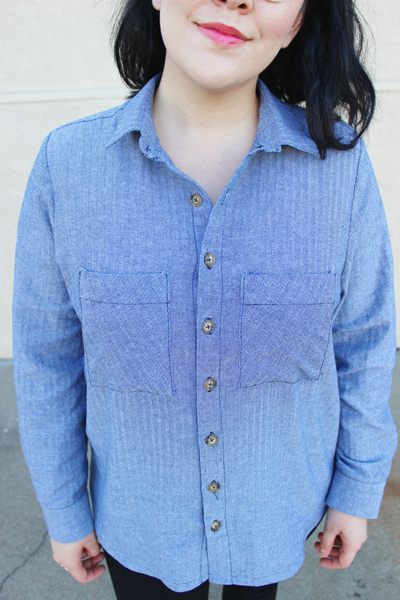 It is a Robert Kaufman chambray purchased from Picking Daisies (my local fabric shop) in San Luis Obispo, California. 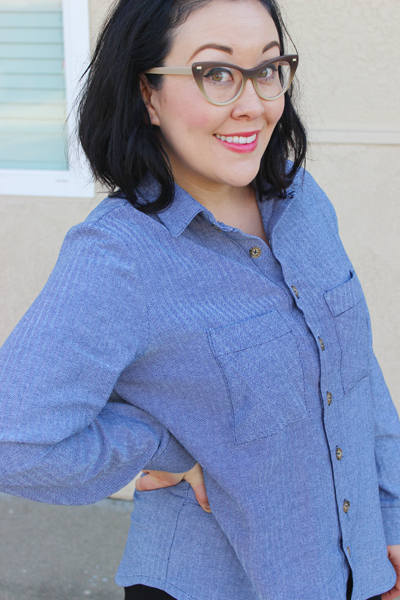 For casual everyday shirts that can be worn to work I really like sewing with fabrics that can be thrown in the washer and dryer and don't need any special care. I find that with a lot of my clothing I end up washing it on cold and hang drying because I am afraid of ruining or shrinking the fabric. Then I get annoyed/run out of time for ironing and garments don't get worn as often as they should. What I'm trying to say is that I like the fact that this is dressier than a t-shirt and I can put this in the dryer, so I'm pretty happy with my life choices right now. Buttons. Buttons were stolen from Archer V.1 and put onto Archer V.2. I liked them and I wanted them in my life. Hem. I pulled a Rochelle and used bias tape instead of the suggested fold twice and stitch method. 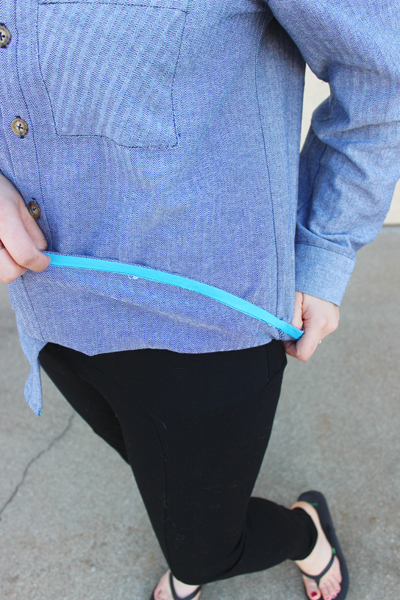 For me using bias tape is easier, I like the fun pop of color, and I don't lose extra length. Well done -it looks really comfy yet put together! I'm glad you've pulled it back and have that "fantastic make" buzz from the pattern the second time! Shirts can be scary- I've just finished my first one and there's so many elements to focus on! 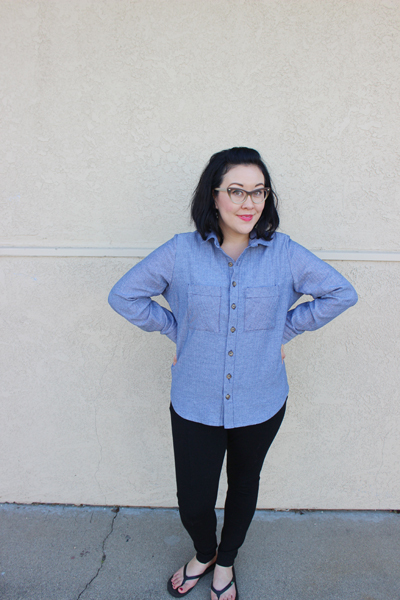 Which pattern did you use for your first shirt? Do you think you will make another?